Each car run the similar code and can be assign different role with different behavior wirelessly by the computer. 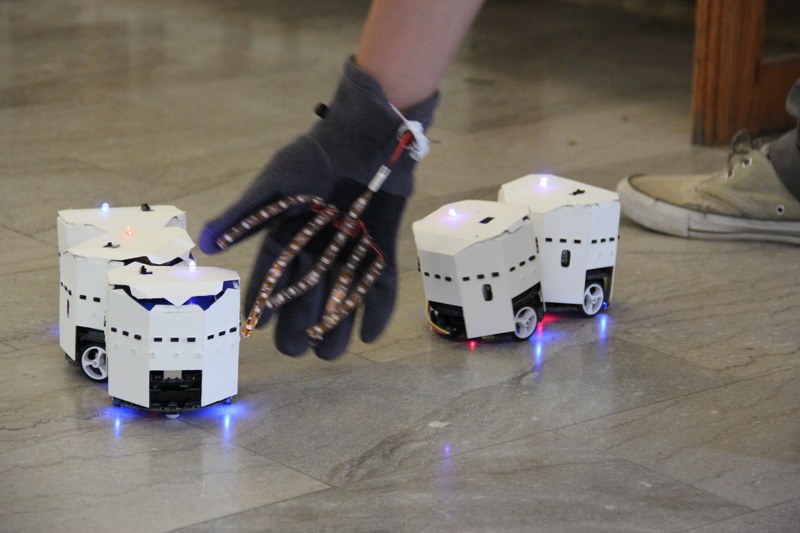 Emergent Behavior of Robotcars from Chen Geng on Vimeo. 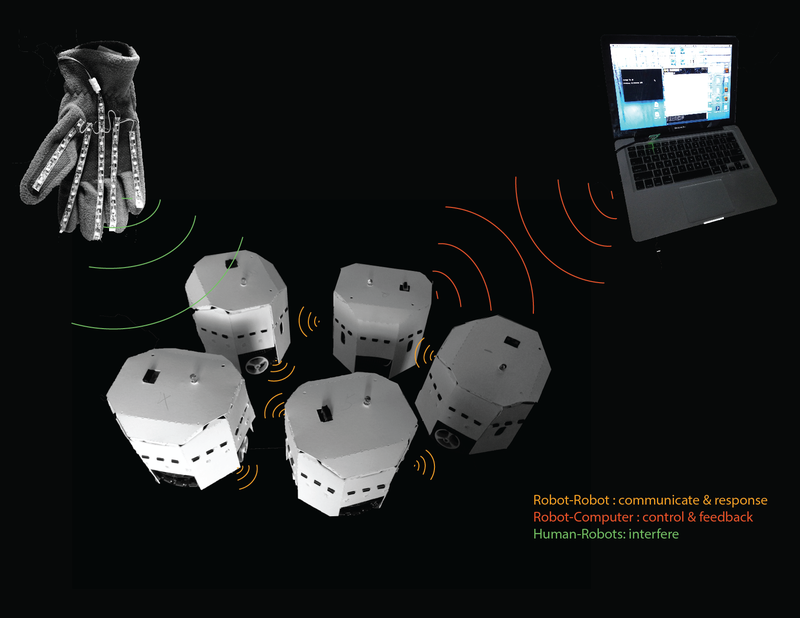 This Project is a robot restructuring the area of a space to be a hinderance to human traffic. 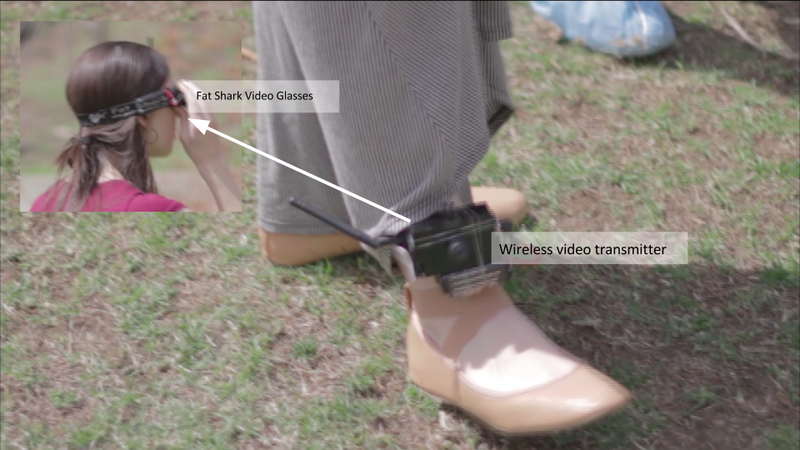 The intervention is to see peoples reactions about a perceived autonomous robot causing discourse. 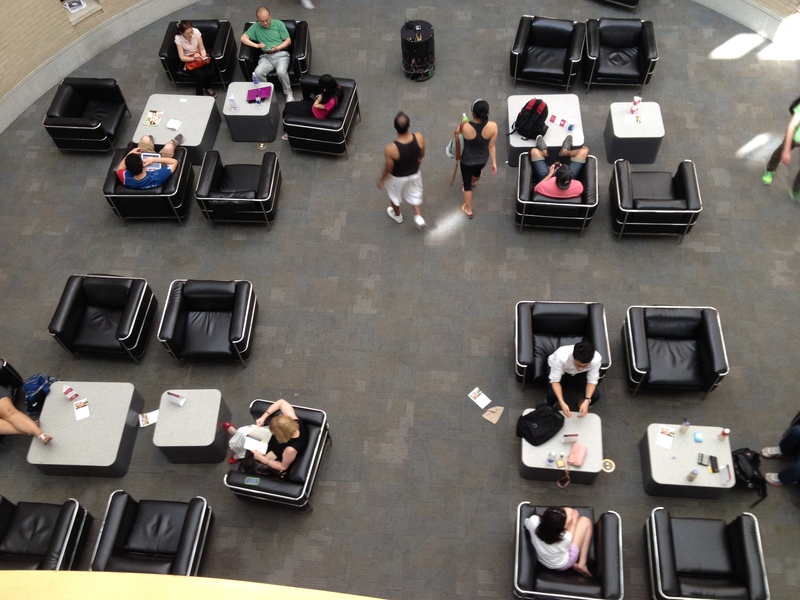 The UC Black Chair are a common communal area. There 20 cushioned chairs, 6 plants, 2 trashcans and 2 stairwell. Time: Tuesday May 14th 3:00 – 7:00. Wednesday 1:30 – 4:30. 70 pound cylinder robot capable of pushing aside heavy objects. 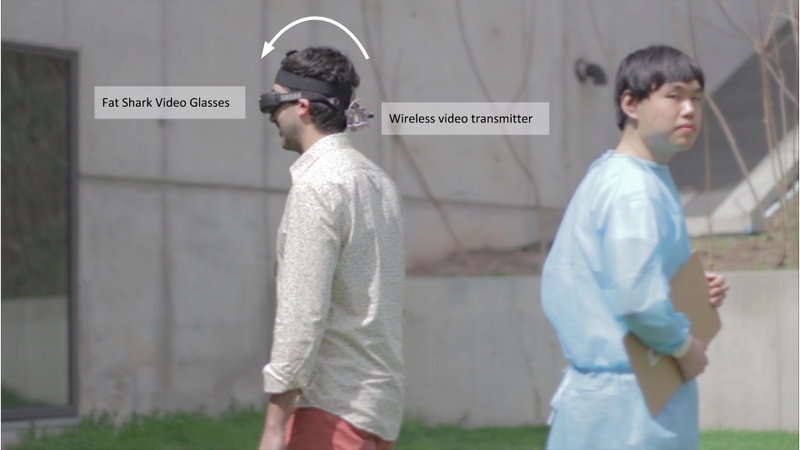 robot is puppeteered from far away with remote and vision system. Audience is unaware of TeleOp control. The Strategy: Block entrances ways, doorways and stairways with the plants, chairs and trash cans. This will see if people react to the hinderance and try to reset the area, or just ignore the blockade and move on. Robots are semi invisible to people. Bystanders assume robot is infallible and executing it task. If robot is doing something strange, spectates assume it to be a bug in the program or error. But the robot itself is never wrong. Due to this infallible mask. I able able to cause discourse is a public space without receiving backlash or punishment of any sort. 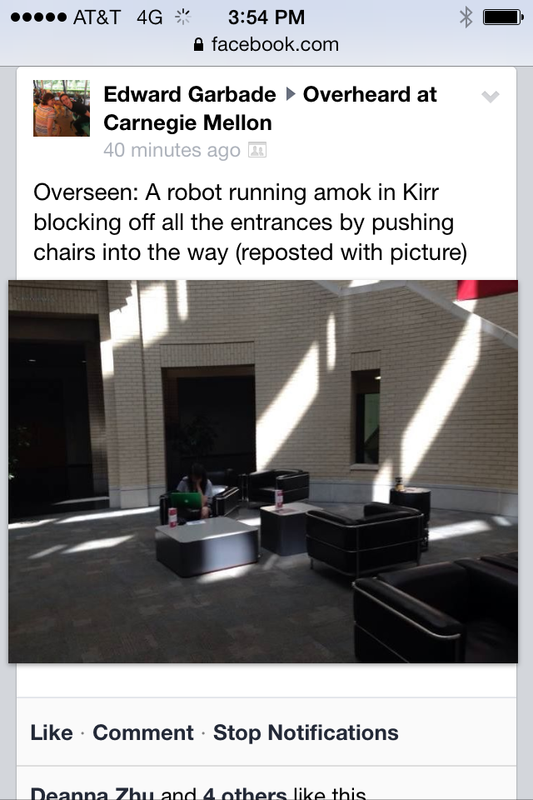 When robot first attempted to move chair, people found it to be entertaining and laughable. During operation, robot would continually hit chair to move it, making a large noise. It would then precisely angle it with little nudges until block was properly positioned. 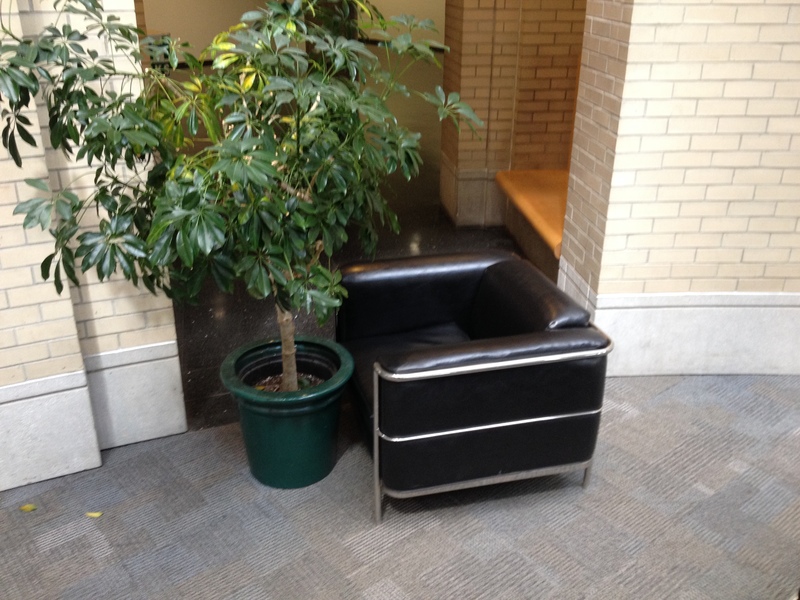 Robot successfully blocked first entrance with chair and plant. People did not stop the robot. People did not remove blockade, neither did the custodians. Flow of traffic through that entrance did stop. But there were two other entrances people could easily use, so the discourse had not yet reached a level of inconvenience. When Robot successful blocked all three entrances, spectators would first try to reset chairs, then impede the robot, and then eventual turn off robot all together. Robot is now a nuisance to society, both in impeding traffic and noise pollution. (Many onlookers evacuated the area due to the robots loud operations.) The robot, first perceived as innocent, is now deem a menace and hence is executed by public. Robot has power to change it’s environment. It is actively attempting to disrupt the natural flow.People tolerate this disruption until it becomes too much of an hinderances and then take action. 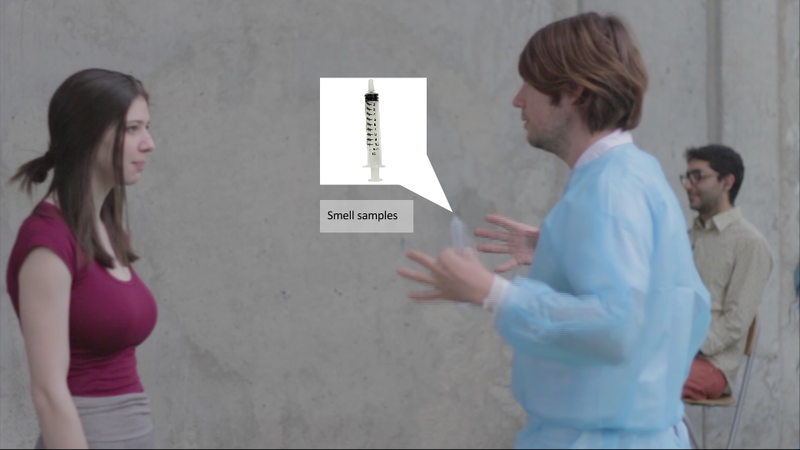 New Clinic for Sensory Vitality, 2014 from Miles Peyton on Vimeo. 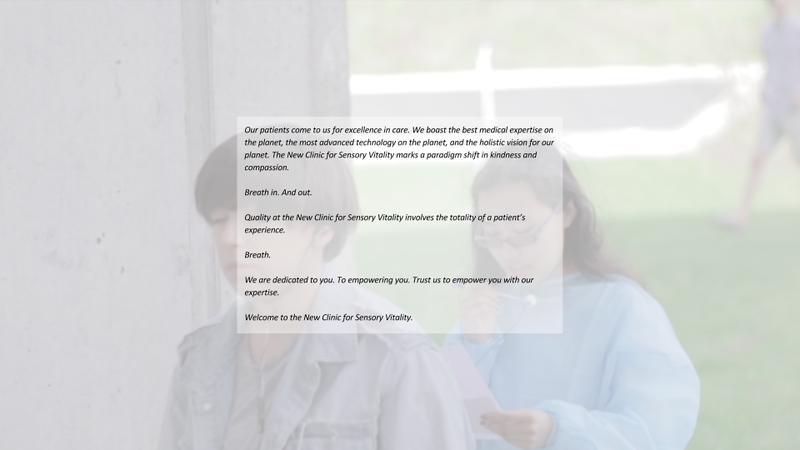 The first New Clinic for Sensory Vitality workshop ran on April 19th. A group of twelve volunteers oversaw the five treatments during the two hours of the event. 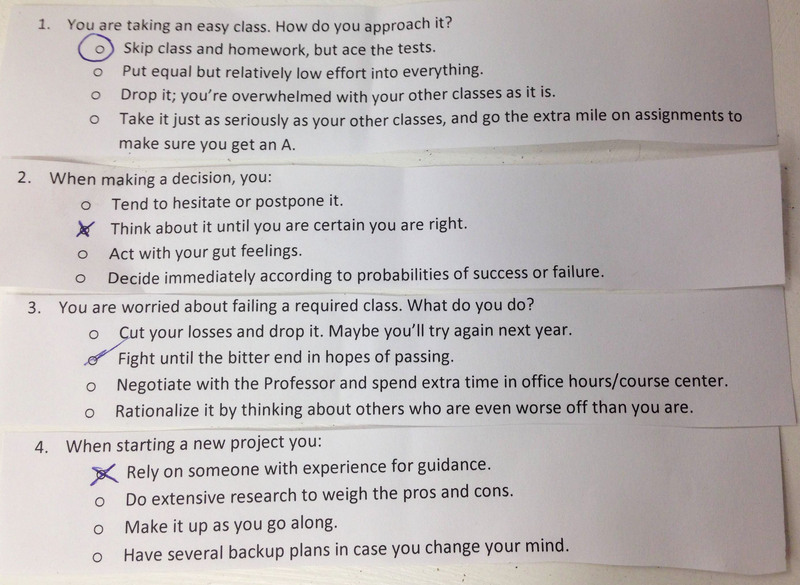 This first run of the clinic was not without flaws, many of which were pointed out to me during our class critique. This document outlines a future direction for the project, based on the recommendations that I received and on my own experience running it. Ideally, a broad demographic would be exposed to the clinic. For this reason, a future iteration of the project would be located at a public site that attracts people of different ages and economic and cultural situations. A transient clinic will benefit from the strategies of street musicians. The clinic should be streamlined and portable. The ages of clinicians impacts the way the clinic is received by the audience. If it is comprised of college-aged actors, then the clinic might be read as a student project. This would undermine its status as a clinic. I am looking for someone to fill the role of an elder to interview patients. The elder is a visionary figure who interviews patients about their experience at the clinic, and ideally provides them with guiding advice. If you fit this role, you will perform during the next workshop for about two hours total. Full exchanges between patients and clinicians were not captured on camera, but in my opinion theatricality was one area in which the clinic was lacking. A future iteration of the clinic would approach conversation with more intention and formal rigor. One technique that artist Tino Sehgal uses to choreograph conversation is prompts, where the first sentence of the conversation is scripted but the rest is improvised. 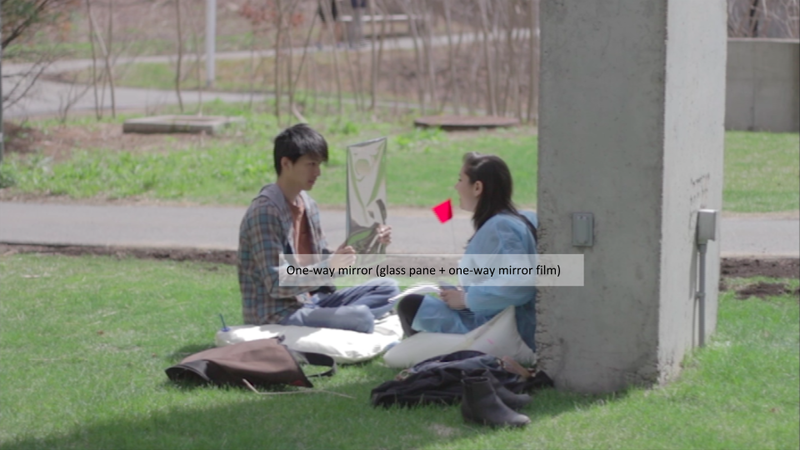 Another lesson from Sehgal is the use of stories to build rapport between strangers. If it is not possible to engage in spontaneous conversation with a patient, the clinician will tell relevant stories, either from previous instances of the clinic or from their past. 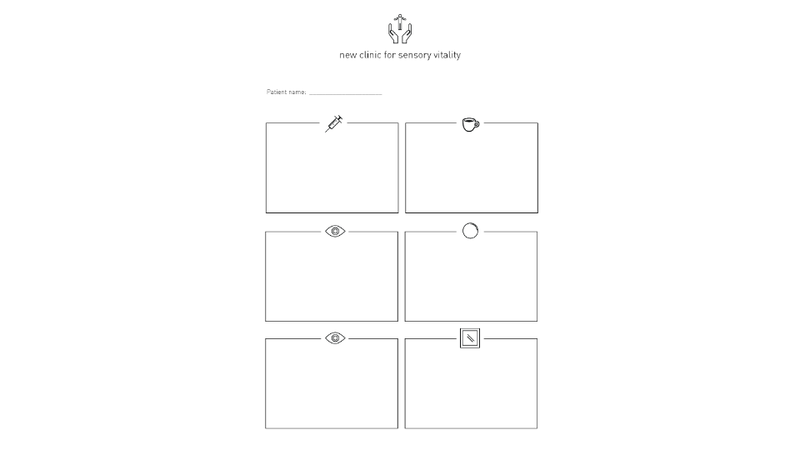 Something that was pointed out to me during the critique was how the clinic was not explicitly medical: it borrowed heavily from the language of corporate branding and new age spirituality. As such, the aesthetics of the clinic need not be explicitly medical. The medical gowns should be replaced by more ambiguous outfits. As some treatments took longer than others, flow became an issue for the clinic. 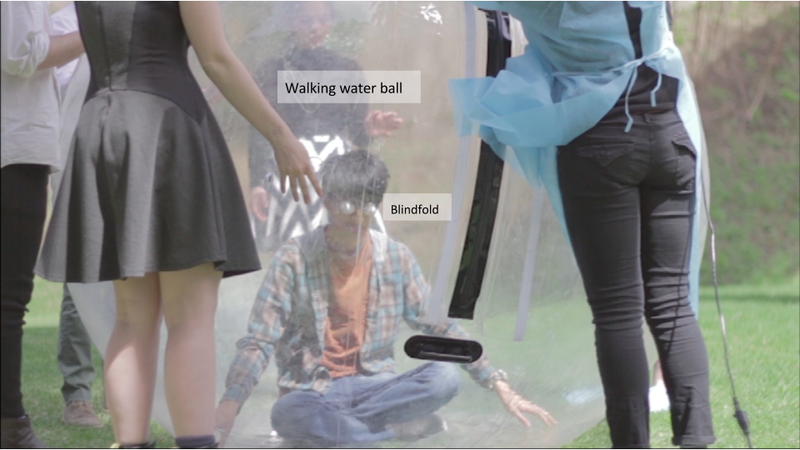 In particular, the Bubble Sound Massage proved to be a bottleneck. Since the Bubble Sound Massage is the treatment that takes the longest, the others treatments will be timed to begin and end with it. One way of doing this is to give a cue when it is time to move to the next treatment. The clinician running the bubble treatment will hit a gong, or make some other signal when they finish. Based on the feedback received, minor changes will be made to the treatments. First, having both the Cyclops Walking Tour and the Limping Walking Tour in the same sequence is redundant: the Limping Walking Tour will be removed. During the event, a clinician ran a treatment for waiting patients. This involved “collecting smells” with syringes. I believe this interim station can be refined. Someone in the critique suggested a scent archive, where different scents are collected and labeled in a grid-like display. Finally, the procedure for the medical document associated with each patient will be refined. Problematically, the elder did not know what each symbol on the document meant. To solve this, clinicians will stamp the document instead of drawing on it. NapBot. 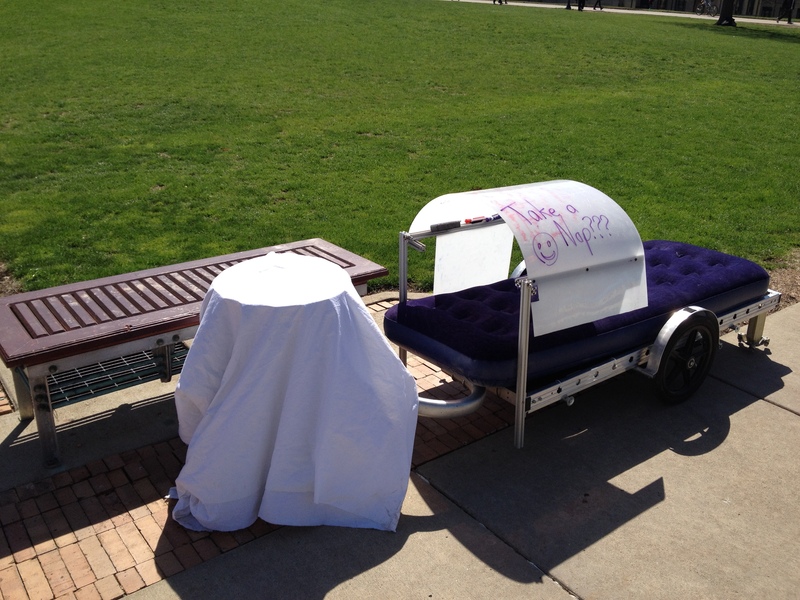 A robotic bed that follows CMU students and asks them to take a nap. 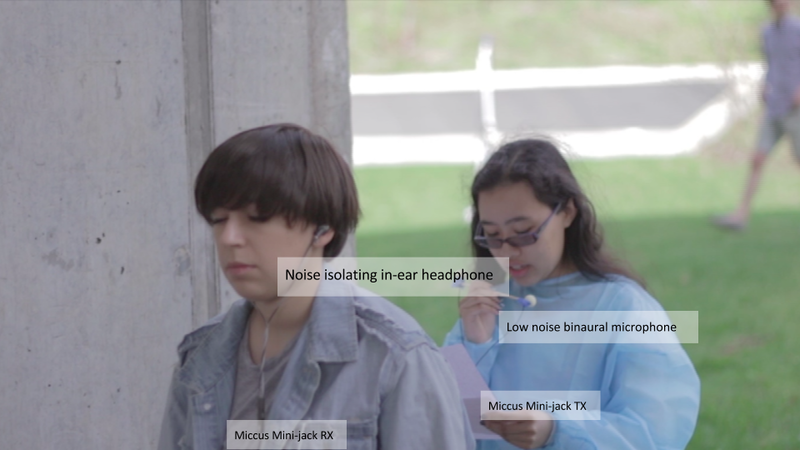 This project was inspired by the relevant sleep deprivation habit myself and other CMU students encounter. 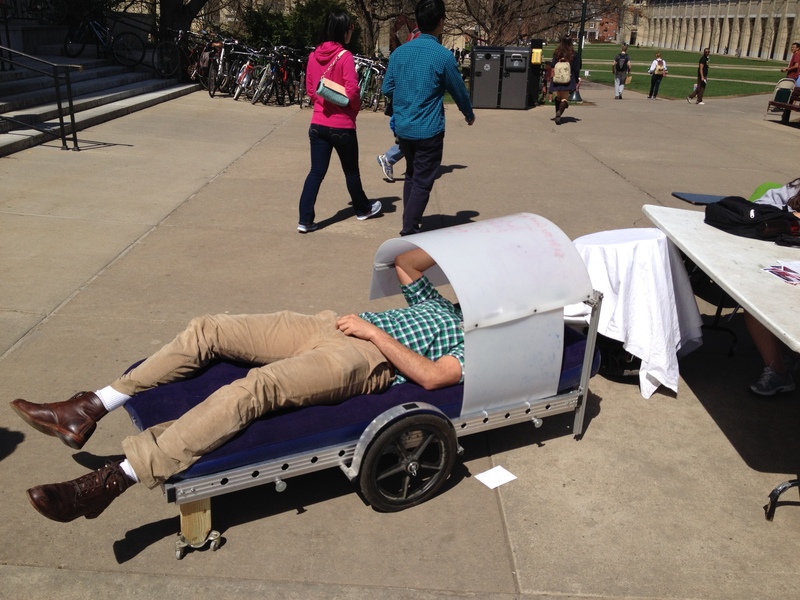 NapBot offer a portable napping area that you can take around campus. Instead of leaving your bed in the morning why not take it with you. 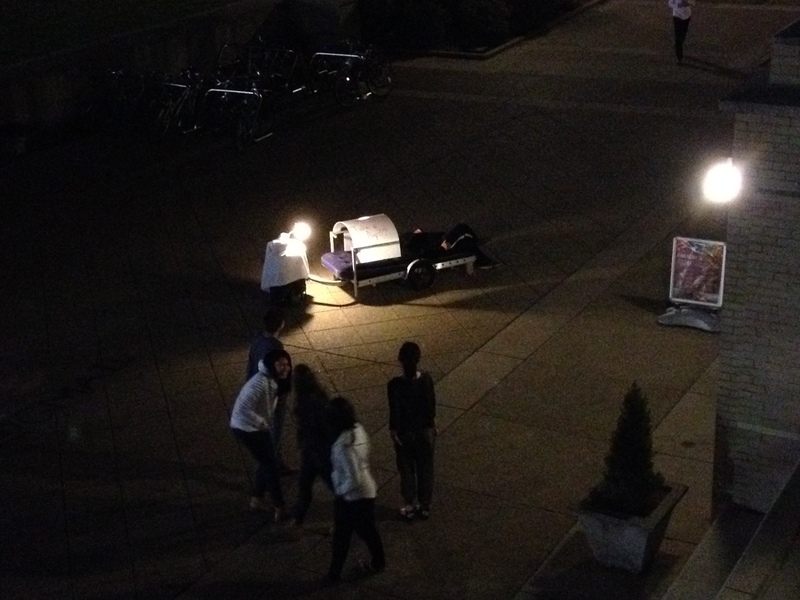 Through tele-operation, NapBot can transport students while they sleep. So student can get to there next class on time while catching some snooze. The head rest dome offer a sense of privacy to the user. 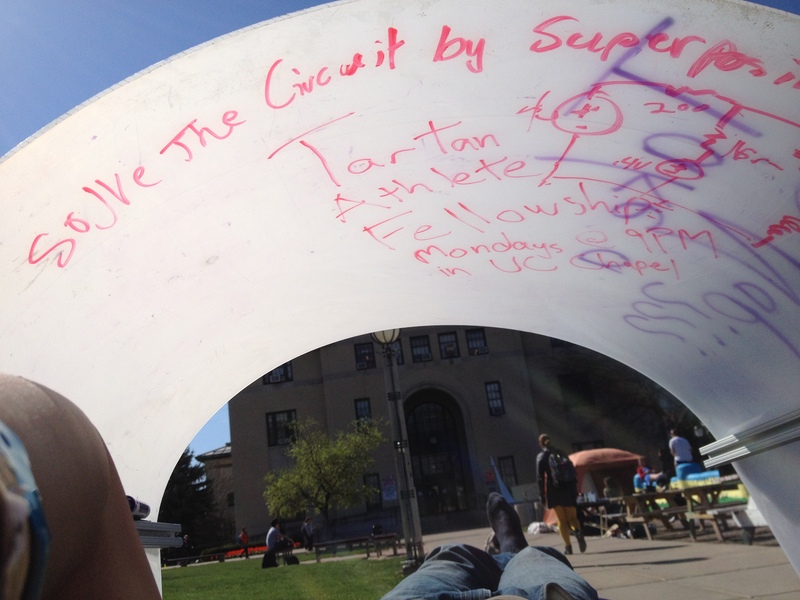 It provides shade form the sun, and doubles a a whiteboard for studying, note taking, or free draw. NapBot can initialize 5 min and 10 min nap sequences. First, user presses one of the nap buttons, then after the set time period is over, NapBot proceed to wake the user up with an alarm. Elements/Tech: Nomad 200 series robot beneath a bed sheet in order to give the appearance of a night stand. 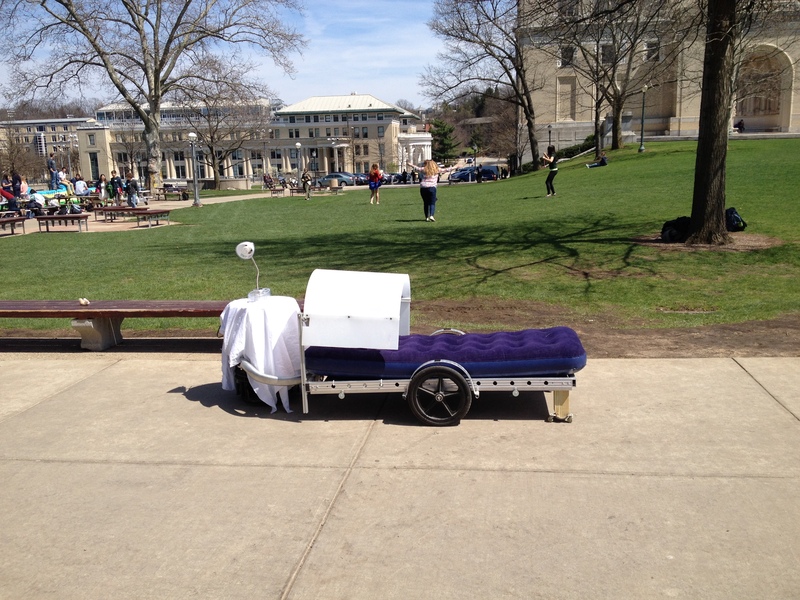 A narrow air mattress rests upon a bike attachable flatbed hook to the robot. The robot is tele-operated via radio control. the dome is fixed to 80/20 upon the flat bed. The dome can lift up for bed mounting. 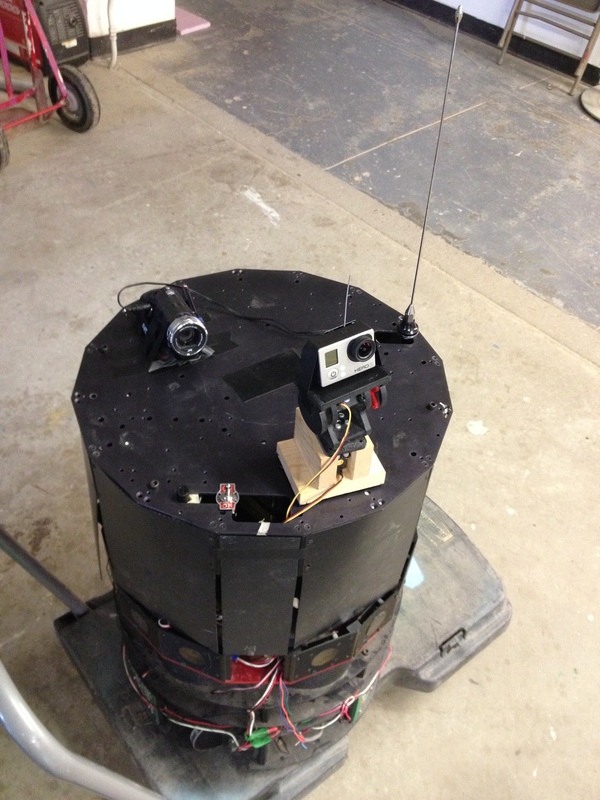 The radio control utilizes an arduino and xbee. 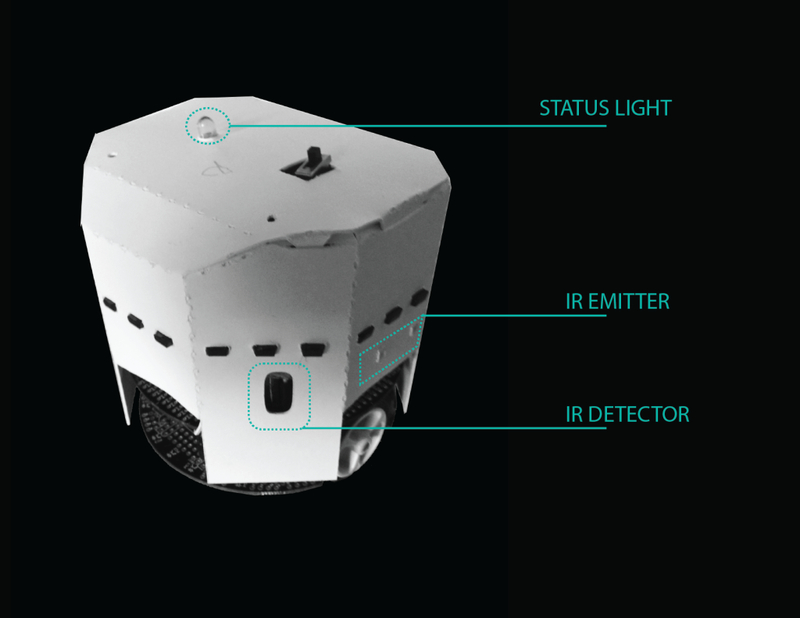 The robots voice is established using a Raspberry Pi and small speaker within the robot. the power source in a battery with an AC to DC Inverter and a power supple to maintain the appropriate voltage for the motor controller. A lamp is added to the top, to complete the nightstand appearance. 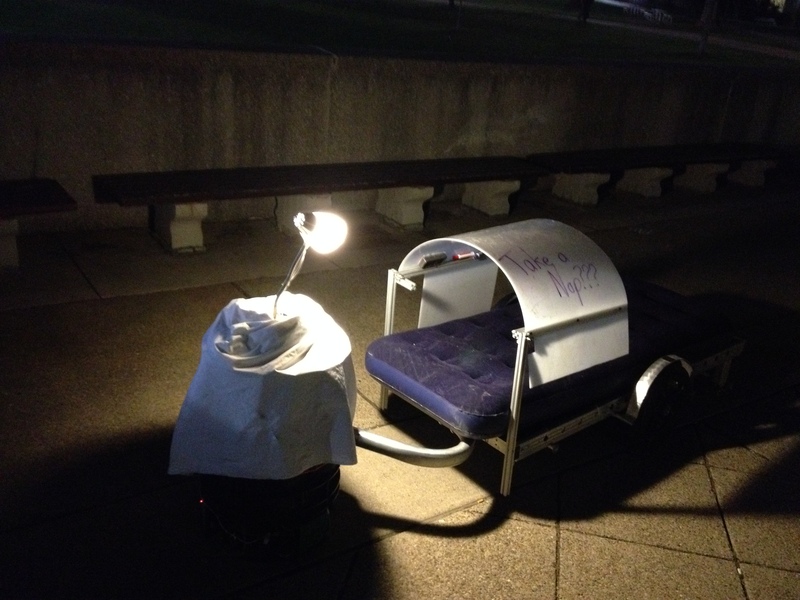 Reactions: A Motorized Bed can be intimidating, there were instances where students actively avoided it or were curious but to cautious to interact with it. Hiding the robot I assumed would make the bed more approachable. but it didn’t seem to make much of a difference. 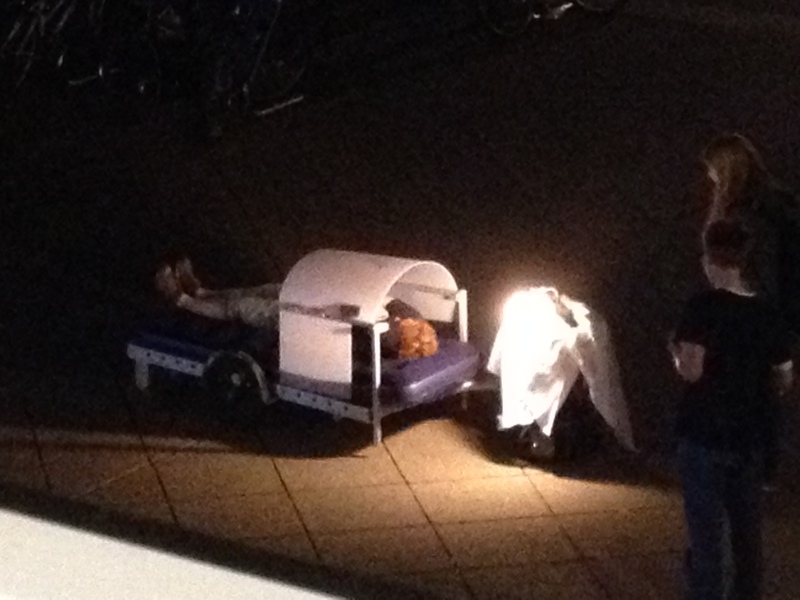 NapBot approach startles spectators. The robot speech gave the bed an extra level of personality. Student clearly understood its purpose. Improvements: Timing is key, Midday test run from 1-4 on a sunny day did not receive the expected response. Student were too lively and awake to make use of NapBot, and thus proceed to ignore it or ride it like a carnival ride. Also during midday, student s are in a rush and too busy to interact with the bed. The lateNight test run from 8 to 10, was instantly recognized. 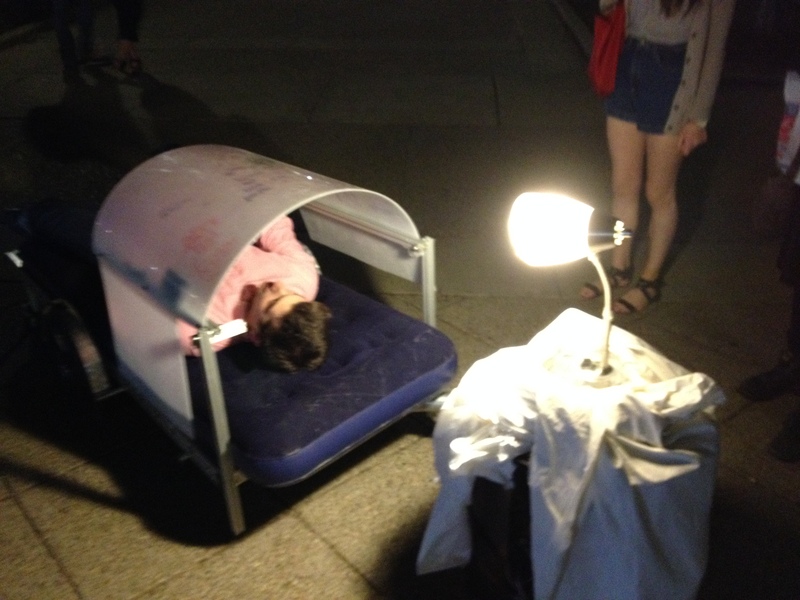 At that time people utilized NapBot for rest. Clarity is important. At first glance spectators are confused and unsure how to of NapBots purpose. By write the message “Take a Nap?” and by having NapBot vocally introduce itself to people, this problem was resolve. Breakdowns are inevitable. The robot broke down 7 times on the first trial. And twice on the second. Either communication cuts out, vibrations knock electronics lose, wheel threads brake, robot tips over, batteries die (9volts = so little ampHours), nightstand sheet gets lodged in drivetrain, or air mattress pops. Final Project: Red or Blue? Red or Blue? 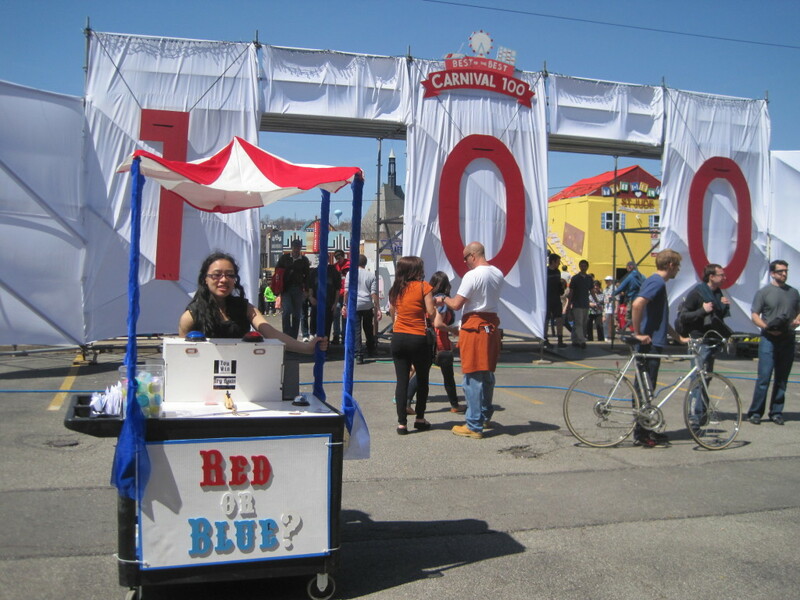 Was a mobile Carnival-style game I deployed during the weekend of Carnegie Mellon University’s 2014 Spring Carnival to examine how CMU students approach risk taking and decision making in a lighthearted setting. Users made decisions to play for high stakes or low stakes, represented by the red and blue buttons. Probabilities for success for each button were represented by playing cards. Those who played for high stakes and pushed the red button had a 10% chance of winning a big prize, a personal anecdote from a current CMU professor on a risk they took in college. If they lost, they would be hit with a rubber band fired from a toy gun. Those who played for low stakes and pushed the blue button had a 50% chance of winning a small prize, a quote from a famous person on risk taking and decision making. If they lost nothing would happen. To play, users had to answer a question about their risk taking habits. Questions ranged from how they approached their easy classes to if they had ever been afraid of being arrested. 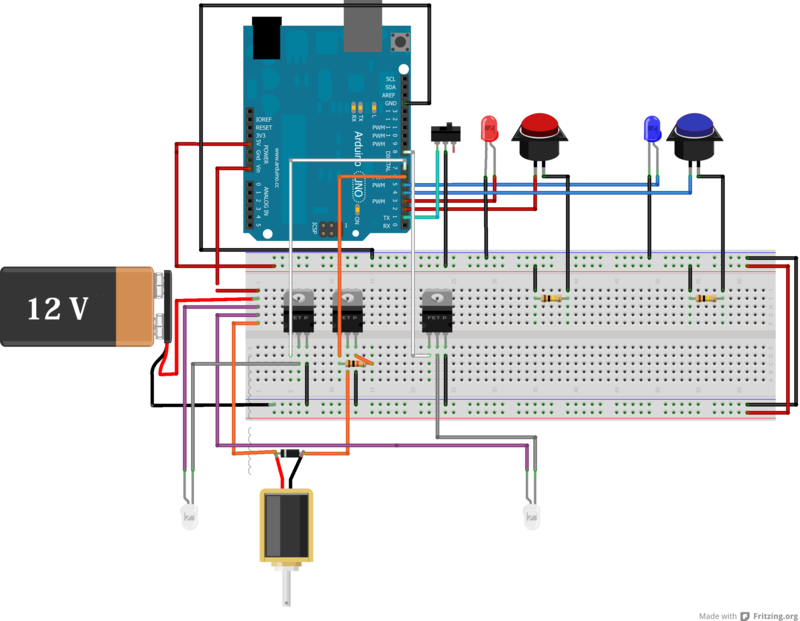 All electronic processes including button press detection, probability calculations, and rubber band firing were controlled by an Arduino Uno. The toy gun was actuated by a solenoid which needed extensive fine tuning in order to fire properly on command. The red and blue LEDs were included inside the buttons and came with built-in resistors. 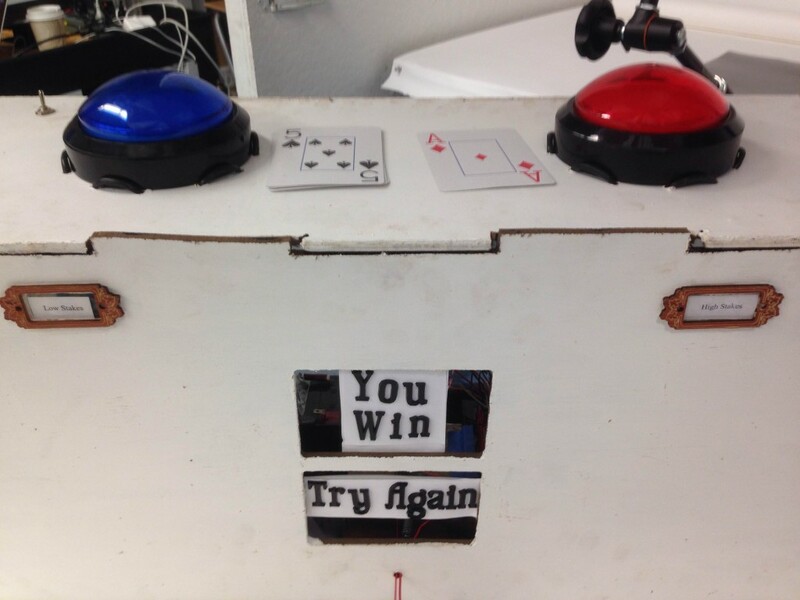 The white LEDs on the bottom were white LED strips which lit up the “You Win” and “Sorry Try Again” signs and also came with their own built-in resistors. 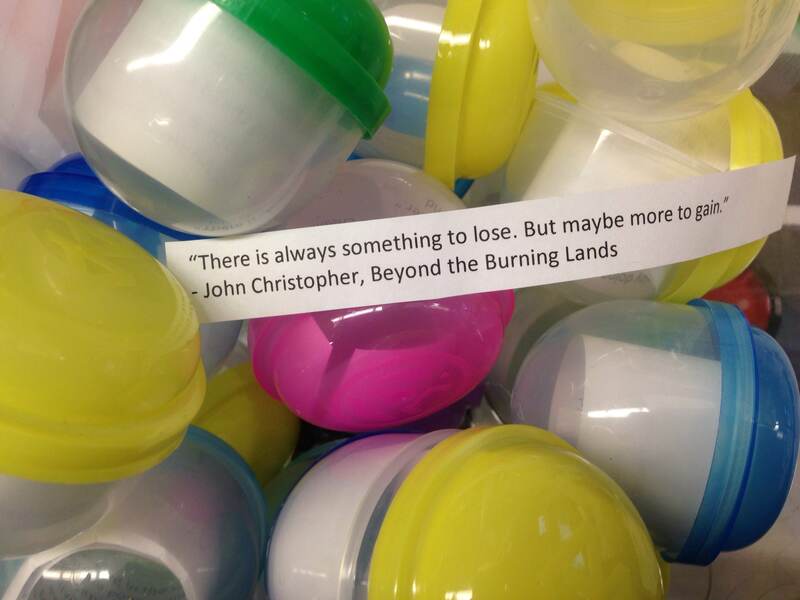 When I brought out this project during Carnival I was surprised by how many people were interested in playing. I did not expect many people to come up to me, but I really pleased by the amount of interactions that I got. 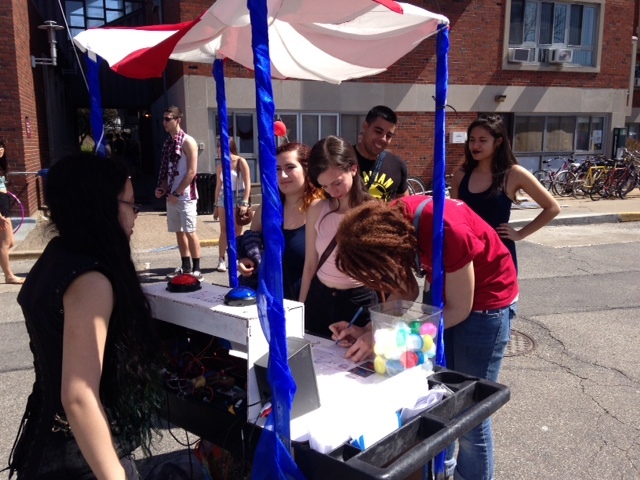 I was surprised when despite my expectations people tended to pick the red and blue buttons in around equal amounts. 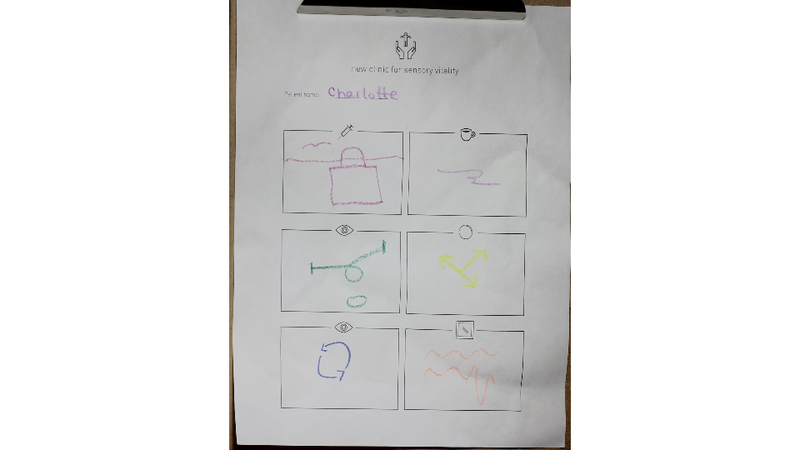 They also asked frequently if this was a psychology study and seemed surprised when I told them it was an art project. However, not everything went as planned. 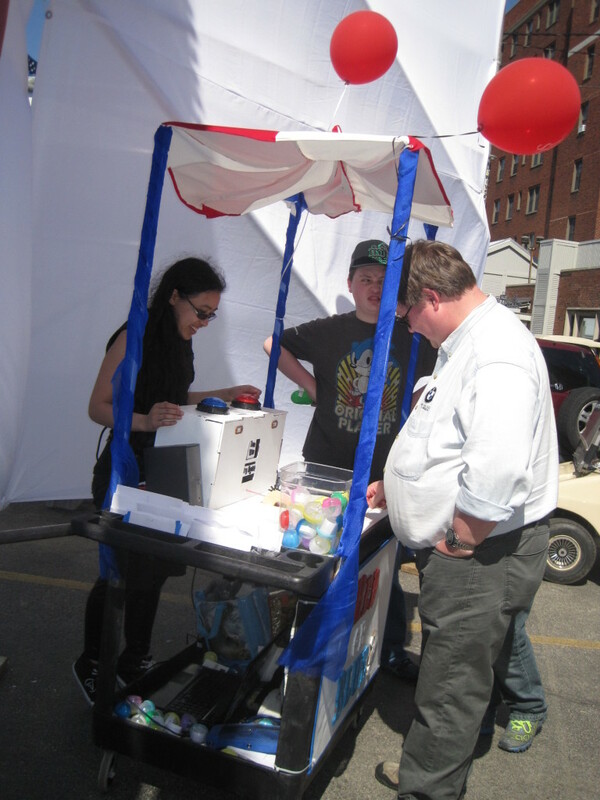 While this project was geared primarily towards CMU students, a few alumni and children played too. 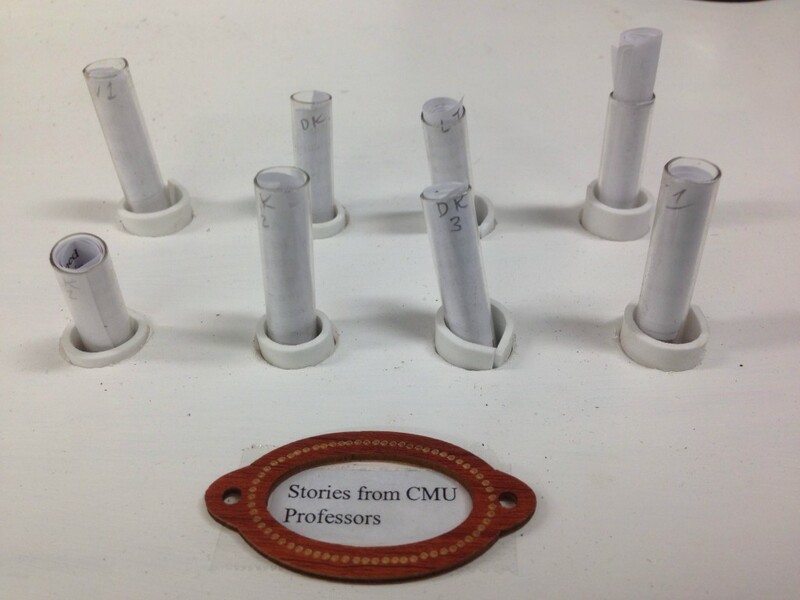 Their answers/data have been kept separate from the data of the CMU students. There were some technical issues too. The tension on the solenoid needed constant adjustment in order for the gun firing to work and people had a hard time seeing the You Win and Try Again lights in the bright sunlight.